The Cisco ASR 9000 Aggregation Service Router platform, also known as the Cisco A9K or ASR 9K, was first released to the channel in 2008. Initially available in a 6-Slot and 10-Slot modular chassis designed to push up to 6.4Tbps of bandwidth, the Cisco ASR 9000 product line has been expanded and upgraded considerably in the past decade, and continues to be a popular router platform for Service Providers. 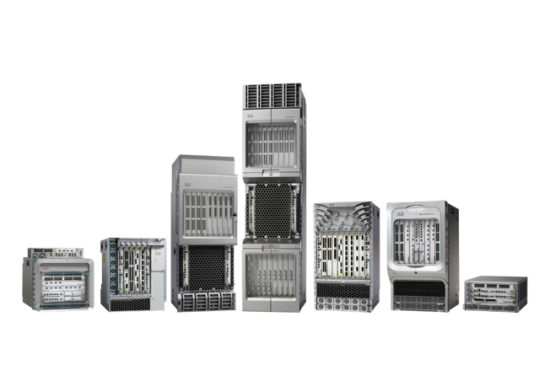 The Cisco ASR 9000 is now available in a much wider range of slot densities from the 2U ASR9001 on up to the 44U ASR9922. Ethernet line card per-port bandwidth has also increased exponentially from the initial 10GE offerings, to current 40GE and 100GE connectivity, with the largest chassis now supporting up to 48Tbps of bandwidth. The current ASR 9K product family has embraced SDN (software defined networking) and Cloud trends and new features including EVPN (Ethernet VPN) and SR (Segment routing). Segment Routing (SR) is an efficient method of source routing whereby the source chooses a routing path and encodes it in the packet header as an ordered list of segments. These segments are a unique identifier for any type of instruction. Each segment is identified by a flat unsigned 32-bit integer, or segment ID (SID). Segment routing has quickly become a preferred methodology in software-defined networking (SDN) deployments, with a combination of centralized and distributed intelligence to enable network simplicity, increased scale, and improved utilization of installed network infrastructure. In 2016, Cisco improved the ASR 9000 product line with additional cloud capabilities including model-driven programmability, native YANG models, OpenConfig and IETF models, in addition to tools and Service level APIs to speed up the adoption of software automation. Ethernet VPN (EVPN) and SDN unlock new, scalable models for business services. The unique control plane control on the Cisco ASR9000 allows practically any type of L2/L3 VPN service to be offered. When segment routing capabilities are added, advanced service level agreements (SLAs) and increased automation are possible. Data center interconnect (DCI) services have traditionally been plagued with complicated scaling issues, mainly because of the requirement for signaling for separate point-to-point pseudo-wire virtual circuit (VC) labels in each remote provider edge device. Failover is also a common SLA issue in many DCI environments. When a virtual machine (VM) goes down in datacenter A, it often doesn’t failover to a VM instance in Datacenter B, and service can be lost or degraded. EVPN (Ethernet VPN) can help solve DCI and scaling issues, running BGP to advertise and learn media access control (MAC) addresses for access topology and VPN endpoint discovery. This method does not require separate point-to-point pseudo-wire VC labels and scales much better. EVPN also enables seamless host mobility for near-immediate fail-over. If a VM in Datacenter A goes down, another VM in Datacenter B is automatically created, with no loss of service. Cisco’s MACSec chips in ASR9000 line cards enables strong encryption and authentication in hardware, offloading these tasks from CPU resources and increasing overall throughput. This is a major concern in DCI environments where links from different datacenters going to public areas need to be quickly encrypted at scale without overwhelming CPUs. Sophisticated, multi vector DDOS (Distributed Denial of Service) attacks can also be mitigated via the virtualized ASR 9k DDoS blocking. NetEquity.com is a leading buyer and seller of Cisco ASR9000 routing hardware. If your organization has decommissioned ASR9K chassis, spare line cards, route switch processors that are surplus to your current operations, contact a NetEquity product expert for a quote. We also sell a wide range of Cisco ASR9000 products.